In following the lead of his US counterpart Donald Trump, president-elect runs the risk of provoking commercial retaliation from Arab states. In announcing his intention to move Brazil's Embassy in Israel to Jerusalem, President-elect Jair Bolsonaro will please his evangelical Christian support base – and break with a half-century of diplomacy. In following the lead of his US counterpart Donald Trump, the incoming president of Latin America's biggest country may not only isolate the country diplomatically but also run the risk of provoking commercial retaliation from Arab states, some of which are major importers of Brazilian meat. "Brazil has been supporting a two-state solution for Israel and Palestine for more than 50 years and this decision could throw all those efforts into the bin," said Guilherme Casarões, a political science professor at the Getúlio Vargas Foundation think-tank. Israel's annexation of east Jerusalem following the 1967 Six-Day War with Egypt, Syria and Jordan, has never been internationally recognised. The United Nations maintains an ambiguous position over any eventual final status for the sacred city – cherished by the three major Abrahamic religions – but a 1947 resolution says it should become a "corpus separatum," run independently of either Israel or the Palestinians. To that end, no embassies should be established there until a solution has been agreed upon by both sides. That was the line followed by Brasilia until Bolsonaro won a second-round run-off election against leftist candidate Fernando Haddad on October 28. He will be inaugurated as Brazil's president on January 1. 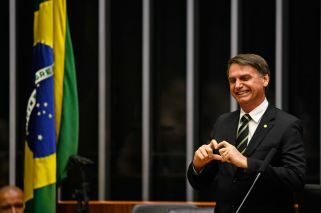 "For me, it's just about respecting the decisions of a sovereign nation," Bolsonaro said in a television interview on Monday. However, he performed an almost Trumpian about-turn on Tuesday by insisting that "it hasn't been decided yet." Were he to abandon that controversial plan, he would risk alienating the religious support that helped propel the far-right ex-Army captain to a commanding victory with 55 percent of the vote. And for them, the status of Jerusalem is sacrosanct. The most conservative evangelicals see Israel as "the centre of all history," a sort of ideal, to which "there is an attachment and a need to defend Israel as a chosen people," said Ronilso Pacheco, a theological researcher at Rio de Janeiro's PUC Catholic University. "That's an extremely literal reading of the Bible without taking into account context, history." Although born into a Catholic family, Bolsonaro married an evangelical Christian and went to Israel in 2016 to be baptized in the River Jordan by a pastor. However, piety is not the only reason for Bolsonaro to move the Embassy, much to the delight of Israeli Prime Minister Benjamin Netanyahu. "On top of the symbolic value for evangelicals, this measure shows a desire to break from a traditional foreign policy based on multilateral relationships," said Monica Herz, professor at PUC's international relations institute. For her, following in Trump's footsteps suggests Brazil is "aligning itself with the American government, something we didn't even do during the military dictatorship." 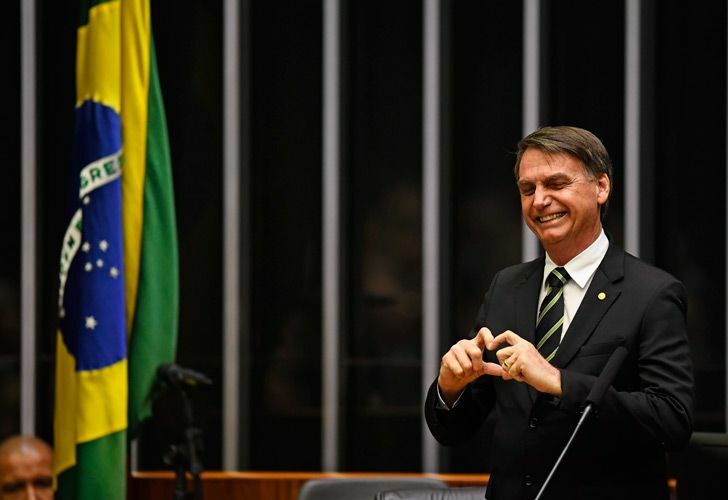 A former Army parachutist, Bolsonaro has made no secret of his admiration for Brazil's military dictatorship, which ruled from 1964-85. His Israeli overtures also have a secondary motivation as Bolsonaro is a fan of Israeli's advanced military technology. His son, Flavio and newly-elected Rio governor, Wilson Witzel, are due shortly to travel to Israel to negotiate the purchase of attack drones which could subsequently be used by security forces in the fight against drug-traffickers. Casarões, though, believes "Brazil could get closer to the US and Israel without transferring its Embassy." Ricardo Ferraço, a member of the external relations commission in Brazil's Congress, said recently that he felt Bolsonaro had been too quick to make his promise, "without reflecting on the consequences." Meanwhile, the Arab-Brazilian Chamber of Commerce has already expressed its concern given Brazil is the biggest producer in the world of hallal meat, much of which is exported to Arab countries. The Palestinian envoy to Brazil, Ibrahim Alzeben, said on Monday that he hoped Bolsonaro had merely been electioneering and that the incoming government would "maintain Brazil's traditional position."